A long, long time ago, way back in the 90s, kids had the coolest toys. One of them, that popped into my head randomly, was the Kanto Pokedex from Pokemon. I wonder what happened to ours… I remember how excited I was at this toy. To me, it was one of the closest ways to become a Pokemon master like in the video games, haha! It let you look up the Pokemon’s information, create a favorites list, and make a “captured” list. Hey, our parents couldn’t complain that we were spending all our time inside playing video games! 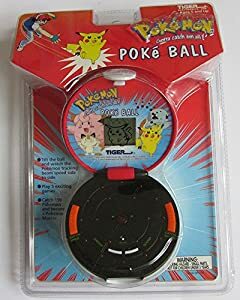 While it’d be amazing to have an upgraded Pokedex toy like this for all seven generations of Pokemon, it definitely would be redundant today with smartphones and Pokemon Go. I think they do have an updated Pokedex toy, though. I’m not sure what region it’s for. Still, seeing the picture of this toy makes me feel nostalgic. I wish I knew where the toy was, but I’m sure it’s long gone by now. But I would love to try to turn it on and see if it still works. Perhaps they’re in the attic somewhere with lots of the old figurines that we used to play with… It’d definitely be interesting to see what Pokemon we had saved on our favorites and captured lists. It’s probably full of the Eevee family, perhaps our go-to starters, and every other species we found cute. Yeah, probably. Either that or we had every single Pokemon on there that we could add because we wanted to “catch ’em all.” I’m definitely going to see if I can track down one of these toys though. I would love to try it out again. Do you remember this toy? Did you have it or another version of the Pokedex? Let us know in the comments below and we’ll chat! As soon as I saw the picture I was hit with nostalgia. I remember wanting a pokedex when I was a kid. I was so jealous of my friends who had one. Never did get one, my parents weren’t into the pokemon fad at the time. I had to borrow friends’ gameboys during lunch break at school if I wanted to play the games. I did have the trading cards at some point though. I still collect the trading cards. I love them. I have to admit the cards that I see nowadays look pretty cool. I stopped collecting them during school. It became harder to buy more cards and I made way too many bad trades with the ones I had. That’s true, but at least it’d be something. I never traded my cards. I always just hoarded them. I couldn’t part with them, lol. I don’t think I’ve heard of that Pokeball tilt game… But now I want one, lol. Lol, that looks so cool! I’ve never seen that before.